There may be certain times of day during which you consistently have more energy than others. You might be a day person or a night person, and many people experience an afternoon slump. However, if you can figure out with more precision when your most creative and energetic times are, you might be able to schedule your writing time near then as well. Get some type of day planner or an app that allows hourly entries or use something like Google calendar to note throughout the day how you are feeling. This doesn’t need to be elaborate; just a word or two or even a number scale from 1 to 5 or 1 to 10 to note how you feel is sufficient. If you can do this several times throughout the day for a couple of typical weeks, you’ll get a good picture of how your energy levels rise and fall. You may be surprised by what you learn. For example, maybe since university you’ve thought of yourself as a night owl but it turns out that these days you’re much more alert in the mornings. Unfortunately, other commitments such as work or child care may keep you from choosing the optimal hours for writing. You might nonetheless be able to rearrange some tasks and chores to make it possible. Choosing a time of day to work when you are sharp and alert can make you significantly more productive. Using the same tools you do for examining what times of day are your best, notice the reasons you are procrastinating as well. The idea here is not to do a complex exploration of your feelings around writing but to note what factors are keeping you from writing. These might include fear, exhaustion, a lack of ideas, feeling that you haven’t planned enough, or worries that you should be doing something else with your writing time. 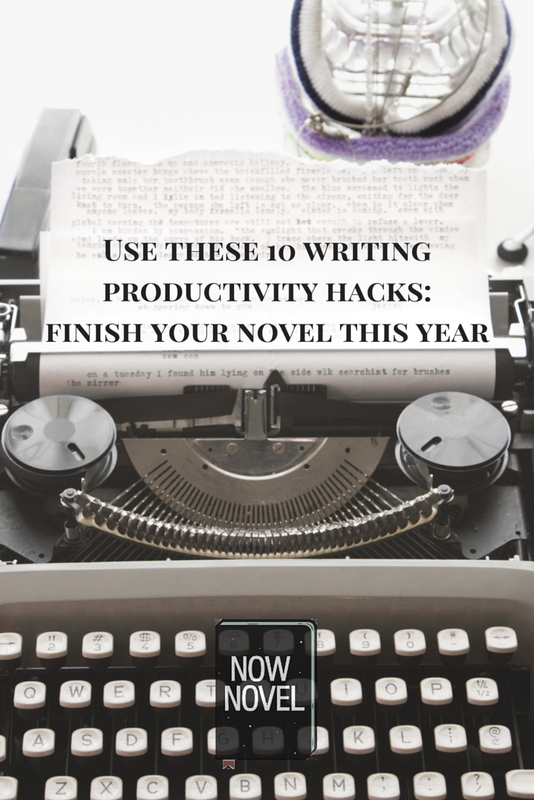 Once you have identified the major blocks to your writing productivity hacks such as those mentioned here will help you tackle them more effectively. Use a voice recorder for capturing fleeting ideas or even to dictate parts of your novel. Try scribbling down passages in five-minute intervals when you have a break during other activities. 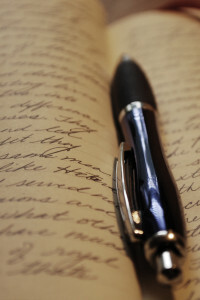 Try working in longhand if you normally use a computer or vice versa. Mix up your location. If you normally work alone at home, try a coffee shop or a library. 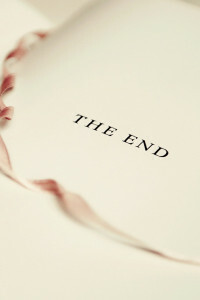 Try writing scenes out of order, or write the final pages of your book first. You may be convinced that the only way you can work is the way that you’ve always done things, but this might not be the case. If you’re not already doing it, track goals whether it’s by word count or page number. 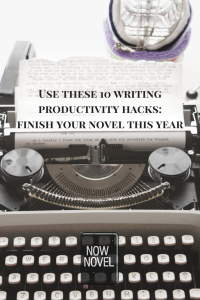 Of all the writing productivity hacks listed here, this is the one that few writers can do without. You won’t have a clear picture of your progress if you don’t keep track of how much work you are doing. Furthermore, setting goals is encouraging as you can look back and see how far you’ve come. Many writers find that writing a fast draft, also known sometimes as a “zero draft,” can result in finishing a manuscript they had been dawdling over. With a fast draft, set a limit of 30 days or so to write a novel manuscript. It doesn’t even have to be novel length. It can be around 50,000-60,000 words because you are going to considerably expand it when you revise anyway. Keep in mind that a fast draft is not even a first draft manuscript. It is somewhere between an outline and a first draft. You can feel free to leave out entire sections, put in placeholders that say “something happens here” and completely change your characters’ histories halfway through. Make notes about changes you think of as you are going along, but keep moving forward. Now that you have your story in place, subsequent drafts of your book should go much more quickly as well. What can you get rid of? Watching television, surfing the internet and other time wasters may be cutting into what could be productive writing time. Nearly everyone has chunks of time or activities they do that don’t do much to promote either productivity or relaxation. Some people have found that cutting out alcohol for a time boosts their productivity while others benefit from removing caffeine. On the other hand, you might find that writing for the reward of a cup of coffee or glass of wine pushes you to produce. One thing you should not cut out is exercise. It’s something that might appear to take up even more valuable time but it improves circulation to the brain, helping you stay focused for long periods of time. Many people who work alone on tasks that require a great deal of focus find that building in breaks is the key to significantly increasing their productivity. The Pomodoro technique recommends working in blocks of 25 minutes. You might find that working for longer bursts can work as well. Many people are also more productive when they limit the time that they have to write. Rather than knowing they have a block of several hours in the afternoon, they might actually be more productive taking just one or two of those hours. This limit seems to stop some people from dawdling and forces them to focus on the work at hand. One of the biggest killers to productivity is mental distraction. The trouble is, the things that pop into your mind when you are trying to focus may actually be important things that you need to do. One solution to this is keeping a notebook beside you when you work and jotting down any important points that occur to you whether they are related to your book or something unrelated. This will help you to keep moving along on your novel. As you cut out unnecessary distractions, you’ll also find that there are things you can’t cut out. There are mindless chores like housework, driving and many forms of exercise that don’t allow you to do any actual writing but do let you plan your novel. You can spend these times that aren’t complete relaxation breaks planning your next writing session. This will help you avoid wasting time when you do sit down to write. A study published in 2006 found that several approaches helped increase the productivity of writers who identified themselves as working at a slower pace than they liked. These included looking at a graphic representation of progress made as well as personal interaction with researchers/mentors congratulating participants on goals achieved and wider recognition within a group. Self-promotion moment: these are all elements featured in the Now Novel novel-writing process. It’s important to keep in mind that not every hack will work for every writer. At times, you may need to experiment to find out what works best for you, and that could lead to a little bit of lost time as you try and discard methods that turn out to be sub-optimal. However, the amount of time you spend testing new methods will pale next to the productivity boost you get from the writing productivity hacks that do work for you. These methods include getting a better understanding of when and how you work best and trying out new things such as fast drafting and writing in bursts with short breaks. You may also find that working with other writers to boost your writing motivation compels you to finish writing a novel. What is one of the best writing productivity hacks that you have found?